Family Day could not have been better – great football weather and victory plus a great sale at the Bookstore. We offered several sessions targeted to give parents the information they need. Above, Mike Raters ’85 and Marc Welch ’99 outlined for a full house what their sons should be considering throughout their four years here. The Q and A was lively all morning – a great sign. Parents have to balance the need to “help” their sons along with letting their sons be responsible. It’s a fine line for sure. We’re already beginning to think about next year…our goal is continuous improvement! Here’s a shot from the Northeast corner of the Bill and Ginny Hays house. 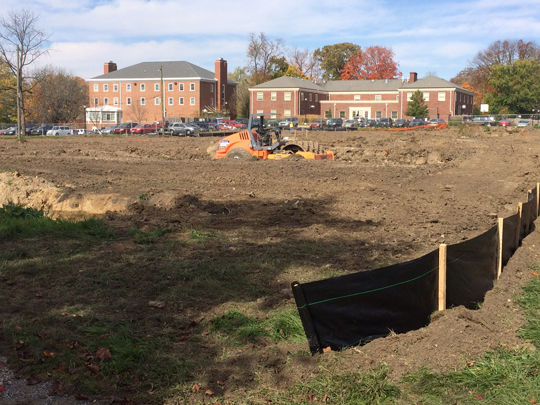 You can see the area is cleared and they are in the process of digging the foundations. The Sigma Chi house (left) and Delt House (Cole Hall for now) are to the north. 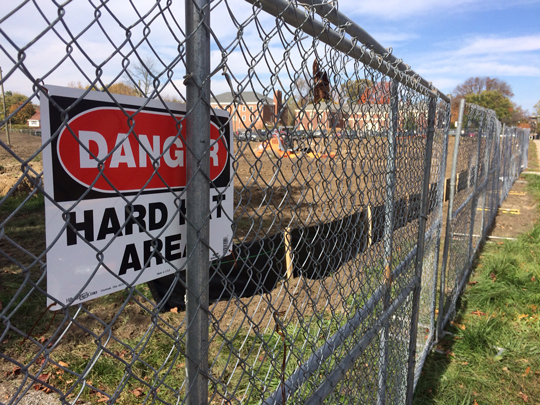 We’re still anticipating the two townhouses will be ready to go next fall…let’s hope it’s a construction-friendly winter! A good friend, a fellow cancer survivor, reminded me, after seeing my post yesterday about Movember, that’s it’s still October and that means Breast Cancer Awareness month. 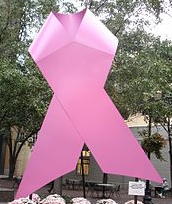 Simple message – get screened for cancer on a regular basis and “encourage” those who you like and love to do the same. This Is NOT the case of what you don’t know won’t hurt you. I was tested and found it early – she was tested and found it early. Gals and guys…get it done! This isn’t directly about Wabash. But, there’s a STRONG Wabash connection. Enter the Grunge ’71 – prostate cancer patient. Enter his classmate and friend Trey Holland ’71…Doctor…urologist. The middle chapters read like analysis…biopsy…diagnosis…surgery. Trey shoots straight with Grunge – Grunge shoots straight with Trey. Grunge takes a very analytic path to treatment – rip the @#$%^&* thing out and the sooner the better. Trey does exactly that. That was 8 years ago. Grunge is a prostate cancer survivor…thanks to Trey. So, MOVEMBER is special to the Grunge. I won’t beg you to make a gift. But, if you want to join me in support this cause, please do. 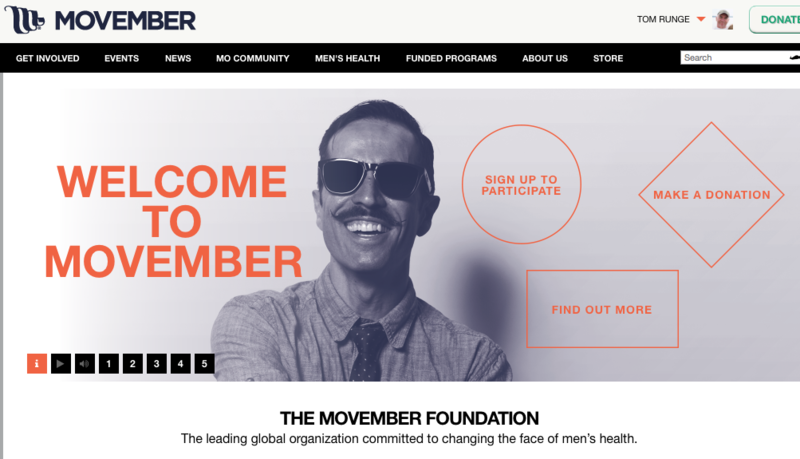 Here’s the web address – I’m already in for this Movember. Spent part of last week with Scott Crawford, Cassie Hagan, and 13 students on the Colorado Professional Immersion Experience (PIE). We visited a number of companies in the Denver and Boulder areas. It was a great trip. Made me proud. Several young alumni out there are making real differences in their companies and their impact shines right through. As I rode around with the students, it was interesting to see their takes on the different organizations as well. 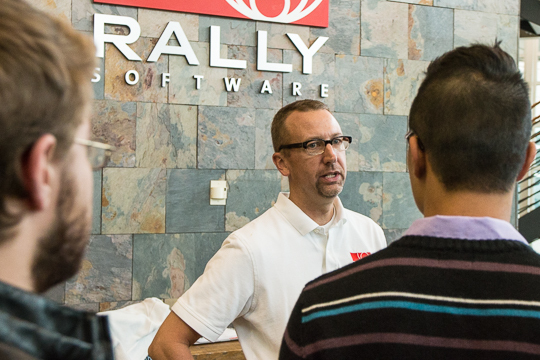 Rally Software started the trip with a great presentation. Rally has been growing at about 30% per year. Michael Sanchez ’90 gave the guys a tour but more importantly an insight into Rally and the kinds of people Rally is looking for as employees. Trips like the Colorado PIE give our guys a huge advantage as they work on networking and also trying to figure out what is next for them. Bottom line, though, hasn’t changed – identify your passion, take any position that gets a foot in the door, work your tail off, and don’t say “No” to an upward move. A great trip…and the area isn’t bad either! Oscar Torres ‘ 01, teacher and coach, couldn’t make it back for Homecoming this year – coaching and teaching responsibilities just didn’t allow the trip. Oscar was honored as an Alumni Admissions Fellow for his outstanding recruiting efforts in Southern Texas during the annual Alumni Chapel. Not to worry said Chip Timmons in Admissions and Chip volunteered to hand-delivery the citation. Chip, as you can see, presented the citations at Oscar’s school. 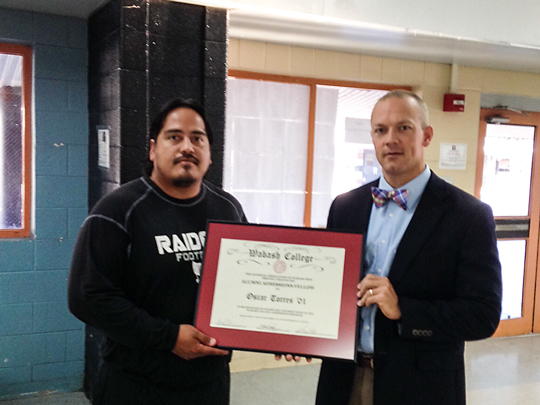 Oscar Torres changes young lives in many ways – as a coach, as a teacher, and as a recruiter for his Alma Mater. Oscar Torres is Some Little Giant! Small Wabash World – In Italy! Rafael sent me the attached photo with a short note. It’s just another example of Wabash men finding each other in far away places. 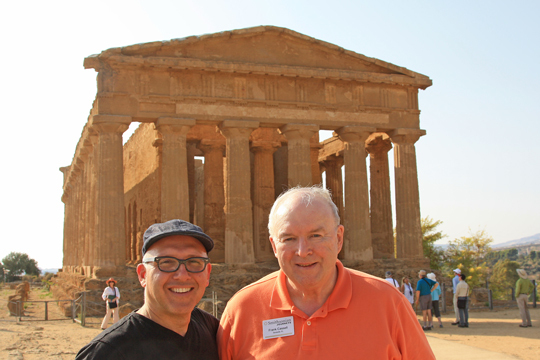 This time it was Frank Cassell ’63 with his wife Beth on a Smithsonian Journeys trip in Southern Italy. Rafael was a study leader on the same trip. Rafael was traveling with partner Andy Laue. 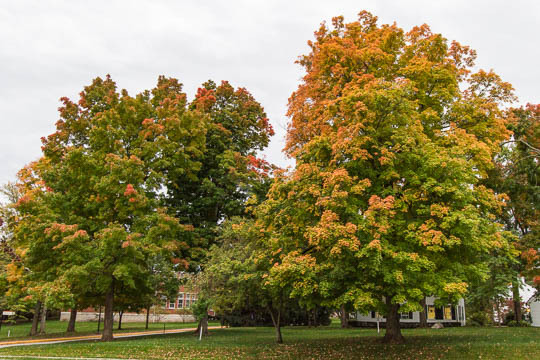 It just goes to show you that Wabash gives you a desire for lifelong learning and also supports the notion that some of your best teachers here and in life are fellow Wabash men. Thanks Rafael for the photo and note! Safe travels to all! 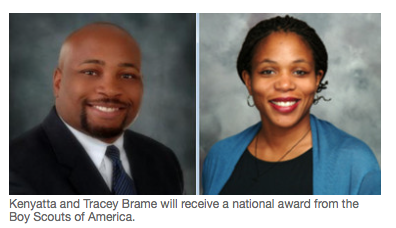 Tracey and Kenyatta Brame saw a need – for their son Kamau and for others. They wanted Kamau to be a Boy Scout and experience all the great opportunities that Scouting provides. They looked for scouting opportunities in the Grand Rapids area but didn’t find one near them. So, they jumped in and made a difference. The Brames started a Cub Scout Pack and a Boy Scout Troop in their neighborhood. You can read the story here. The Boy Scouts of America took notice of the results Troop Leader Kenyatta and Den Mother Tracey are delivering and last week the couple received the Whitney M. Young, Jr. National Service Award. Well done Tracey and Kenyatta!!! When you get the latest Annual Giving letter in the mail from Rich Calacci ’91, hang on to it. Read it. Take yourself back to your – you, your son, you and your son – ringing in ceremony. Check out Rich’s letter. Spend a minute looking back…and then think about investing in YOUR Wabash. Rich has also included a list of the Class of 2018. Dallas, TX. Escondido, CA. Tolleson, AZ. South Riding, VA. Fort Recovery, OH. Olney, MD. The Russian Federation. Vietnam. China. A couple of guys who went to high school together at Reitz Memorial in Evansville, IN. 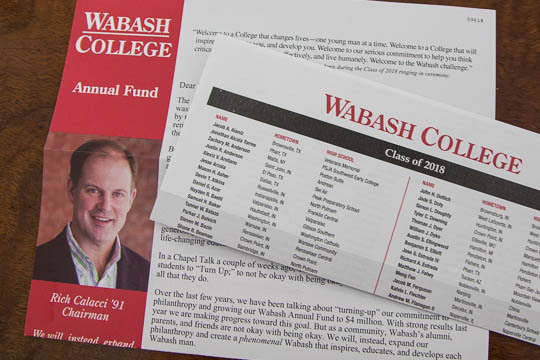 Look through the list – I’ll bet there’s a Wabash freshman who lives in your neck of the woods. Reach out – let him and his family know you’re there and more than happy to help. You’ll feel good about it. Took this early this morning from the front porch of the Hays Alumni Center. I think fall is here! It’s a great time of the year on campus..unless you have papers and tests. 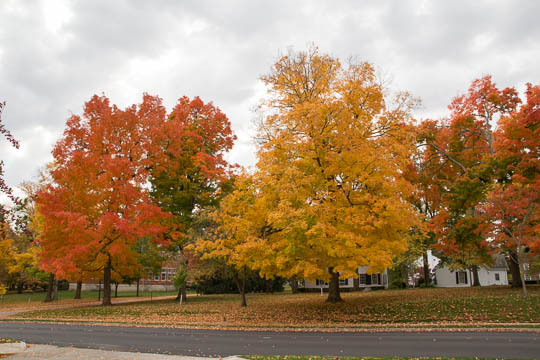 Those tend to get in the way of relaxing and enjoying Wabash football and the crisp clean air of the fall. Work has a way, as well, of cutting those enjoyments short – but I digress. 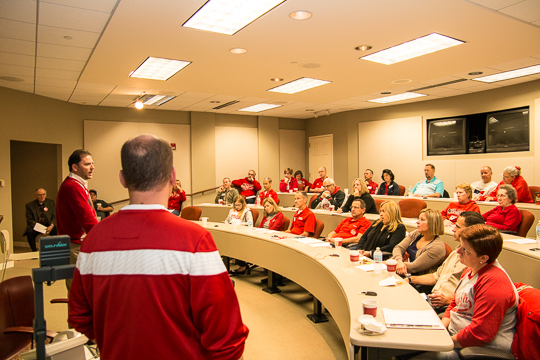 WABASH Day kicks off tomorrow – a great weekend to join other members of the Wabash community in serving your local community. There’s probably a project near you and it isn’t too late to jump in. Check it out here.